The railway station aims to become an important link of the electromobility chain within the city. In order to reach the decarbonisation of transport goal, the electric car will be an important part of the new urban scenario in the urban mobility. The intermodality between the train and the road will be easier if the electric car is parked in the railway station. During the time that customers are using the train for travelling, the electric car is being charged in the car park. When the customers come back to pick up their electric car, it will be completely charged. The energy necessary to feed the cars’ battery could be available from the breaking energy of trains. The railway energy network is independent from the city’s energy network, then it is a good opportunity to create a big area of recharge for electric vehicles without interference with the energy power plan of the city’s network. According to a study of ADIF, in the Sevilla-Santa Justa station occurs an average of 180 passenger train arrivals per day, so the energy generated by braking reaches 9 MW/h per day; this is an annual total of nearly 3 GW/h. Given that an electric car takes 17 KW/h for a 100 km travel, the energy generated would have been used to run nearly 53,000 km per day in electric cars, saving 4.5 tonnes of CO2 per day. Energy storage systems: technologies of supercapacitors and batteries; Energy accumulators, as its name suggests, allow to store energy in any of its forms, so that it can be used later. In this way gets undock the demand of power generation. 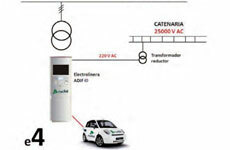 Electric vehicle recharging points: Recharges carried out by type 2 usually do not move from the 16A single phase, for normal recharging. Raising the nominal current of the system until the 32nd for processes fast charge. Where the supply system is three-phase, and for rapid recharging systems power level rises until the 63rd. Energy efficiency and quality of network The set of power systems installed on micro intelligent network formed by the catenary, quality network and loads, distributed storage system, are intended to extract, modify, store, and manage the electrical energy in the most efficient way possible, always ensuring the quality, reliability, robustness, and security of electricity supply. E-maintenance: E-Maintenance as a maintenance strategy, i.e., a method of electronically using real-time data obtained from the equipment using digital technologies (mobile devices, sensors, technology, Internet, etc.) as a maintenance plan (i.e., a structured set of tasks with an interdisciplinary approach that includes the monitoring, diagnosis, prognosis) may be considered (decision and control processes), as a type of maintenance (based on CBM, proactive and predictive maintenance) or as a maintenance support (i.e., resources and services needed to carry out the maintenance). Business plan: Development of a methodology that includes the procedures to commissioning technical modules. Also, proposal of different business cases, legal aspects, identifying investment, costs and savings by determining the repayment (payback) period of the facility.